At McDonald’s we‘re about more than just flipping burgers. We’re here to make sure we’re focused on our customers. They are at the heart of everything we do, everyday. Across the country we see over 200,000 people each day. With so many people coming through our doors, we need our people to welcome our customers to McDonald’s and strive to make their day easy. How do we do this? 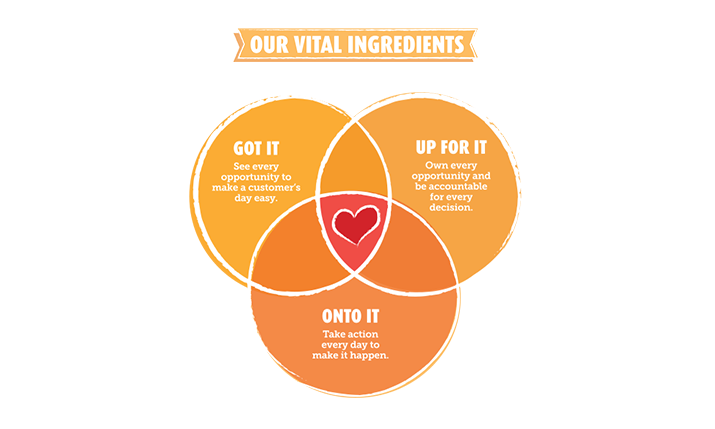 By following our Vital Ingredients. So what are the Vital Ingredients? 1. The first ingredient is what we call “GOT IT”. ‘Got it’ means we will always be looking for an opportunity to make a customer’s day easier because we understand what a positive difference it can make. 2. The second ingredient is what we call “UP FOR IT”. ‘Up for it’ means we recognise it’s our responsibility to take the opportunity to make a customer’s day easier and we want to own that opportunity. 3. The third ingredient is what we call “ONTO IT” which means ‘take action’. “ONTO IT” means we believe in action, we are go getters, starters, and we are finishers. We see the idea or opportunity through to completion and customer satisfaction. Do you think you have the Vital Ingredients? Find out more about working at McDonald’s and see if you’ve got the right attitude to join our team.